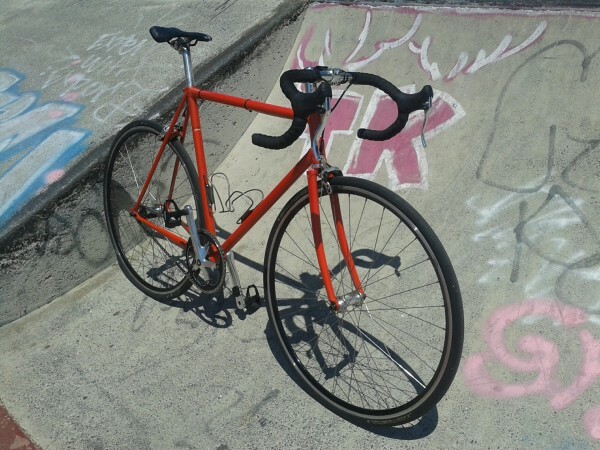 A couple of photos of my Wabi Cycles Special at the skate park next to the Murarrie Criterium Track in the Murarrie Recreation Reserve in Brisbane. 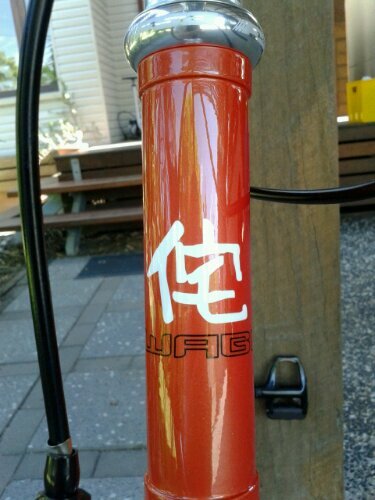 This entry was posted in Bicycles and tagged Wabi, Wabi Cycles, Wabi Special on 6 October 2015 by Rex. 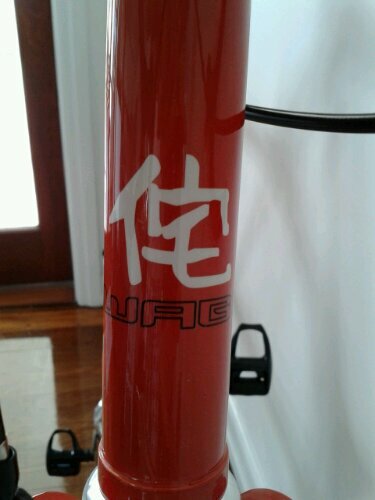 I have started the process of customising my Wabi Special from Wabi Cycles. I have replaced the front tyre with a Continental Grand Prix 4000S. I plan to replace the rear tyre when my new freewheel, chain and chain ring arrive. The original tyres on the Wabi Special were Kenda Koncept tyres. My previous experience with Kenda bicycle tyres had not been particularly good, so I was keen to replace them. According to my wife’s digital kitchen scales, the Kenda Koncept tyres weighed in at 221 grams, with the Kenda tube at 94 grams. The Continental Grade Prix 4000S weighed in 213 grams, while the Vittora Ultralight tube I fitted was 82 grams. Curiously, a second set of identical Continental/Vittoria tyres/tubes weighed at the same time tipped the scales at 217 grams and 92 grams respectively. I have saved the heavier tyre/tube set for fitting to the rear wheel. In retrospect, the Kenda Koncept tyres actually were pretty good value and quite okay as OEM equipment. The difference in weight is only 20 grams comparing the Kenda tyre/tube set with the lightest Continental/Vittoria tyre/tube set. The road feel of the Continental tyres was not noticeably superior to the Kenda tyre either. Unless you are a serious weight weeny, the Kenda Koncept tyres are quite okay as OEM equipment. Wear them out and then replace them with your favourite set of rubber. For me, the Kenda Koncept tyres will be used on a new bike build, Project Beetlejuice. 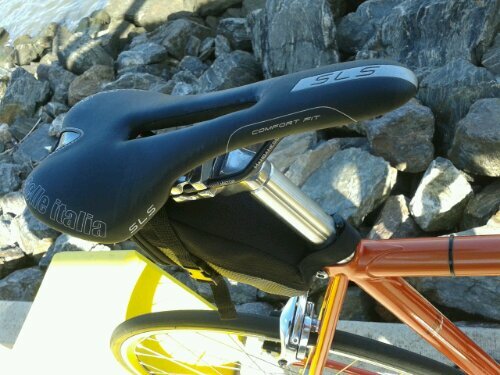 I have fitted the Selle Italia SLS Kit Carbonio Flow saddle to my Wabi Special. There was nothing wrong with the original saddle from Wabi Cycles, but I use the Selle Italia SLS Kit Carbonio Flow saddle on my other bikes, so I have also fitted it to my Wabi. More info on the saddles is here. I am planning to use the OEM saddle also on Project Beetlejuice. For more posts on my Wabi Special, explore the Bloke’s Lens Tigger tag, or Bloke’s Post Tigger tag. 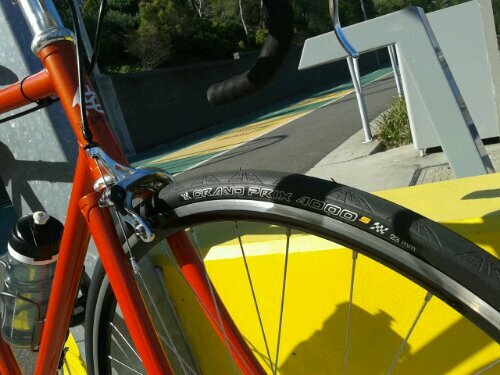 This entry was posted in Bicycles and tagged Continental, Grand Prix 4000S, Tigger, Tires, Tubes, Tyres, Vittoria, Wabi, Wabi Cycles, Wabi Special, Weight Weenie on 23 February 2014 by Rex. 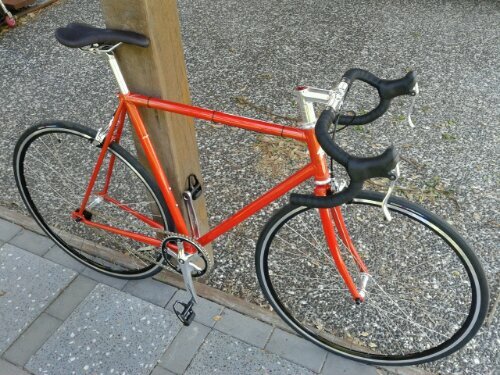 I am collecting parts to customise my Wabi Special from Wabi Cycles. 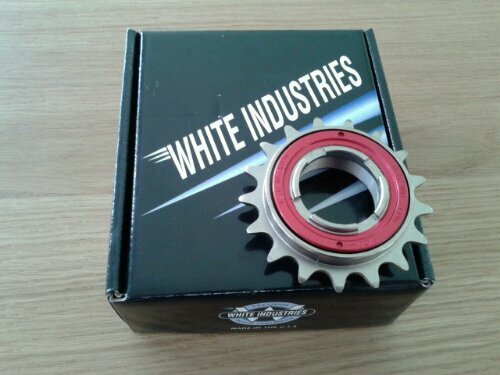 This is a 17 tooth White Industries ENO freewheel. I could not justify spending $110 on a freewheel on my other cheap singlespeeds, Bumblebee and Wonder Woman; but I can on my beautiful Wabi Special that I have named Tigger. Thanks to Gear Shop Brisbane for supplying the freewheel. My plan is to mate the 17 tooth freewheel with a 52 tooth chainring. The 52/17 combination will effectively give me the same gear ratio (80.4 gear inches) as using a 46/15 chainring/freewheel combination (80.6 gear inches). This is one tooth up on the 46/16 combination that I am currently riding. Freewheels generally only come in 16/17/18 teeth, so purchasing a 15 tooth freewheel was not an option. For the record, the 17 tooth White Industries ENO freewheel weighs in at 174 grams on my wife’s kitchen scales. This entry was posted in Bicycles and tagged ENO, Freewheel, Gear Brisbane, Gear Shop Brisbane, Tigger, Wabi, Wabi Cycles, Wabi Special, Weight Weenie, White Industries on 19 February 2014 by Rex. 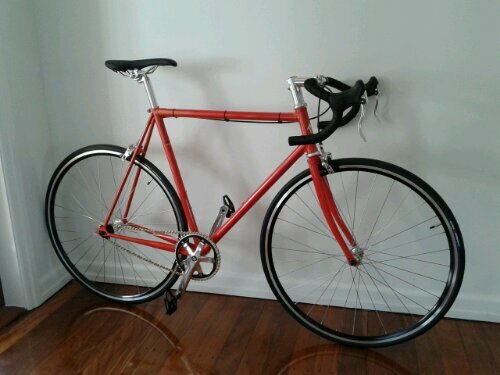 I am customising my Wabi Special from Wabi Cycles, that I have named Tigger. 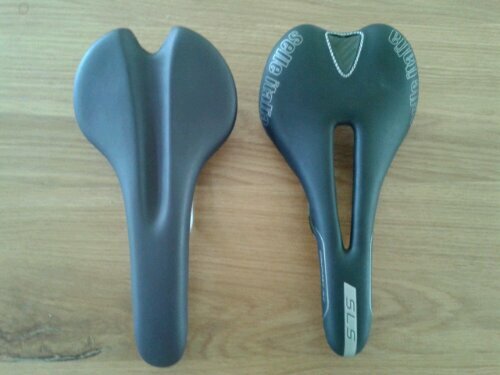 First off is to replace the saddle with a Selle Italia SLS Kit Carbonio Flow saddle. I have ‘borrowed’ this saddle from Project Beetlejuice, which is on the backburner now that I have the beautiful Wabi Special in my fleet. There is nothing wrong with the standard Wabi Cycles black racing saddle. The saddle is perfectly okay for its intended purpose and is quite comfortable for rides several hours in length. 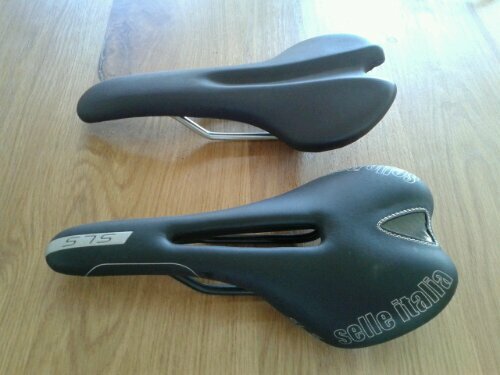 I just prefer the Selle Italia SLS Kit Carbonio Flow saddle as I am using the same saddle on some of my other bikes. For the record, the original Wabi saddle weighed in at 262 grams; the Selle Italia SLS weighed in at 215 grams on my wife’s kitchen scales. This entry was posted in Bicycles and tagged Saddle, Selle Italia, SLS, Tigger, Wabi, Wabi Cycles, Wabi Special, Weight Weenie on 19 February 2014 by Rex. 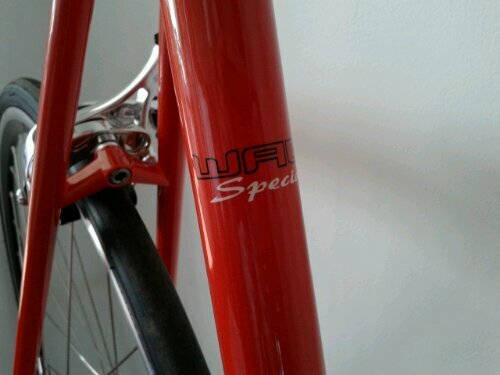 These are the first photos of my new Wabi Special — 8.4 kg of lugged Reynolds 725 double butted steel frame goodness. These photos are of the bike straight out of the box, with only Shimano PD-R540 SPD SL pedals added. The bike still needs to be dialed in, so things like the seat angle are not quite right. 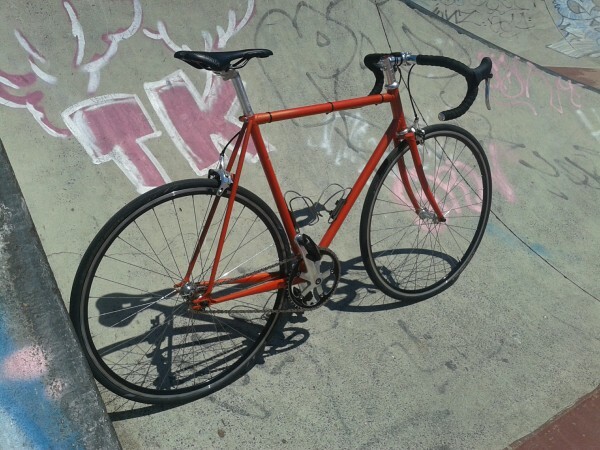 This entry was posted in Bicycles and tagged Tigger, Wabi, Wabi Cycles, Wabi Special on 29 December 2013 by Rex. My wife decided she would like to buy me a bike for Christmas. This box turned up on our doorstep on 24 December. 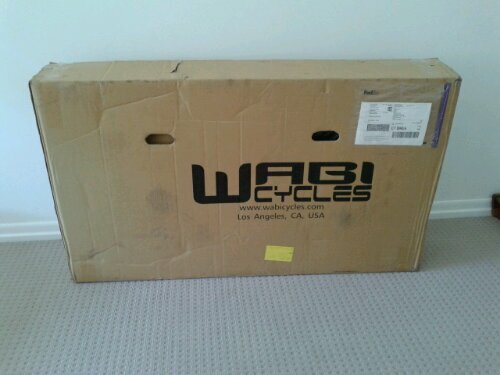 Mmmm, a Wabi Special. Road racing inspired frame design for a fast but comfortable ride. I can’t wait to unbox this bike and take it for a ride. This entry was posted in Bicycles and tagged Wabi, Wabi Cycles, Wabi Special on 24 December 2013 by Rex.